Identification: In general, cichlids (Cichlidae) are superficially similar to sunfishes and black basses (Lepomis and Micropterus; family Centrarchidae). Cichlids can be distinguished from centrarchids by a single nostril opening on each side of the head (vs. two openings in centrarchids) and the presence of a discontinuous or two-part lateral line (vs. a continuous lateral line in centrarchids). 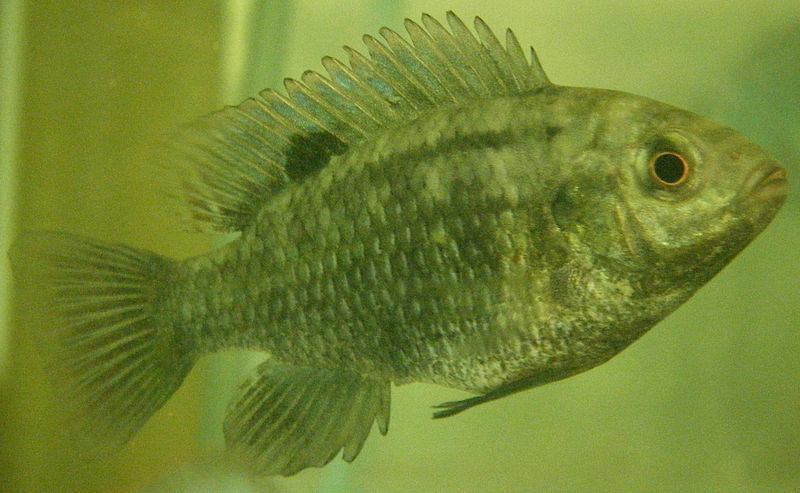 Distinguishing characteristics of banded tilapia were given in Thys van den Audenaerde 1964, de Moor and Bruton (1988), Eccles (1992), and Skelton (1993). This species is included in keys of Skelton (1993). It was illustrated in de Moor and Bruton (1988) and in Eccles (1992). For color illustrations or photographs of this fish, see Goldstein (1973), Axelrod (1993), and Skelton (1993). Size: to 23 cm SL (Skelton 1993). Native Range: Tropical and subtropical Africa: Kasai drainage including the Lulua and Kwango (middle Congo River basin), upper Congo River basin including the upper Lualaba, Luvua, Lake Mweru, Luapula, Lufira, and Upemba region (Thys van den Audenaerde 1964), upper Cuanza, Cunene, Okavango, Lake Ngami, Limpopo, Sabi, Lundi, northern tributaries of the Orange River, and Bangweulu (Teugels and Thys van den Audenaerde 1991), Lake Malawi, and Zambezi system (Skelton 1993); distribution map provided in Philippart and Ruwet (1982). Table 1. States with nonindigenous occurrences, the earliest and latest observations in each state, and the tally and names of HUCs with observations†. Names and dates are hyperlinked to their relevant specimen records. The list of references for all nonindigenous occurrences of Tilapia sparrmanii are found here. Means of Introduction: Probable fish farm release or escape (Smith-Vaniz, personal communication). Status: Failed in Florida (Courtenay and Stauffer 1990; Courtenay and Williams 1992). Remarks: In response to suggestions that T. sparrmani be introduced into California, Pelzman (1972) evaluated its life history and recommended it be placed on the prohibited list because of its potential for competition with native sport fishes. In Africa, this species has been introduced outside its native range as a forage fish for bass (de Moor and Bruton 1988). It can tolerate low temperatures of about 7°C (de Moor and Bruton 1988) and, based on its distribution in Africa, T. sparrmani may be "more restricted by high (above 32°C) than low temperatures" (Skelton 1993). Voucher specimens: Florida (UF 56197, 56198). Courtenay, W.R., Jr., and J.D. Williams. 1992. Dispersal of exotic species from aquaculture sources, with emphasis on freshwater fishes. 49-81 in A. Rosenfield, and R. Mann, eds. Dispersal of living organisms into aquatic ecosystems. Maryland Sea Grant Publication, College Park, MD. de Moor, I.J., and M.N. Bruton. 1988. Atlas of alien and translocated indigenous aquatic animals in southern Africa. South African National Scientific Programmes Report 144. Foundation for Research Development and Council for Scientific and Industrial Research, Pretoria, South Africa. Goldstein, R.J. 1973. Cichlids of the world. Tropical Fish Hobbyist Publications, Inc., Neptune City, NJ. Pelzman, R.J. 1972. Evaluation of introduction of Tilapia sparrmanii into California. California Department of Fish and Game, Inland Fisheries Administrative Report 72-3. Unpublished mimeograph. Skelton, P.H. 1993. A complete guide to the freshwater fishes of southern Africa. Southern Book Publishers, Halfway House, South Africa. Smith-Vaniz, W.F., J.D. Williams, L.G. Nico, and W.F. Loftus. Key to the cichlid fishes of Florida. Unpublished mimeograph (in prep). Teugels, G.G. and D.F.E. Thys van den Audenaerde. 1991. Tilapia. 482-508 in J. Daget, J.P. Gosse, G.G. Teugels and D.F.E. Thys van den Audenaerde, eds. Check-list of the freshwater fishes of Africa (CLOFFA). ISNB, Brussels; MRAC, Tervuren; and ORSTOM, Paris. Vol. 4. Thys van den Audenaerde, D.F.E. 1964. Révision systématique des espèces congolaises du genre Tilapia (Pisces, Cichlidae). Annales du Musée Royal de l'Afrique Centrale, Sciences Zoologiques 124:1-155.